Malignant Pleural Effusion (MPE) often appears in late stages of malignant solid tumors, develops rapidly, can seriously affect patients’ life quality, or even threaten their lives . Current treatment methods targeting malignant tumors, which fail chemotherapy or re-occur after treatments and associate with MPE, include thoracocentesis, Indwelling Pleural Catheter (IPC), intravenous chemotherapy, pleurodesis, surgical treatment, targeted therapy, etc., but their clinical efficacies are rare [2,3], and the average survival time is only about 3-5 months [4,5]; furthermore, patients are prone to occurring cough, chest tightness, dyspnea, weight loss, or other symptoms, thus living in poor conditions . At present, Indwelling Pleural Catheter (IPC) is more commonly used in clinics, which is safer and more thorough, and can direct inject antineoplastic drugs for the treatment of MPE, but its efficacy is poor [7-9]. The main reason for its poor efficacy is related to tumor cells’ tolerance to chemotherapeutic drugs , so exploring effective treatment methods and drugs against MPE is a clinical emergent problem. We have achieved good clinical results in our previous studies through applying innovative abdominal indwelling for the administration of verapamil combined with chemotherapeutic drugs in treating MPE . In addition, changing the administration route of verapamil combined with chemotherapeutic drugs in treating liver cancer , colorectal cancer , gastric cancer , or lung cancer  also achieves good clinical efficacies, and no side effect in the cardiovascular system have been observed. Based on our previous studies, we investigated the clinical efficacy, side effects, and survival time of applying verapamil combined with chemotherapeutic drugs for MPE through PCC. From December 2004 to December 2014, a total of 79 patients with non-encapsulated MPE were treated in our department, who were all applied standardized chemotherapy while failed or recurred. All the patients voluntarily attended the research, including 41 males and 38 females, aging 25~85 years. The average age of group C was 56.62 ± 1.733 (n=37), and the average age of group T was 56.67 ± 1.546 (n=42). There was no significant difference in the age between the two groups (P=0.9845, P>0.05). Total cases of the two groups: 39 cases of Non-Small Cell Lung Cancer (NSCLC), 11 cases of Breast Cancer (BC), 16 cases of Esophageal Cancer (EC), 9 cases of Gastric Cancer (GC), and 4 cases of Colorectal Cancer (CC). Group C: 16 cases of NSCLC, 6 cases of BC, 10 cases of EC, 3 cases of GC, and 2 cases of CC. Group T: 23 cases of NSCLC, 5 cases of BC, 6 cases of EC, 6 cases of GC, and 2 cases of CC (Table 1). All the patients or their family members had signed the informed consent; this study was approved by our hospital ethics committee. The follow-up ended until December 31, 2016. Table 1. Distribution of patients’ data. (1): Clearly diagnosed as malignant tumor by pathological evidence, and the exfoliative cytology of thoracio-abdominal water revealed tumor cells associated with MPE or clinically diagnosed as MPE ; (2) Karnofsky (KPS) Score ≥ 50 points; (3) heart rate>60 beats/min while without Electrocardiogram (ECG) block; (4) expected survival time>3 months; (5) aging 25-85 y old; (6) voluntarily accepted the treatment protocol and signed the informed consent. (1) Female patients in pregnancy or in lactation; (2) with mental issue or retardation; (3) with acute infection; (4) with central nervous system symptoms; (5) with allergies; (6) WBC<4.0 × 109/L, BPC<10.0 × 109/L, and Hgb<60 g/L; (7) with blood clotting disorders; (8) cannot strictly implement the treatment protocol; (9) with intolerable severe adverse reactions, or incomplete information and cannot perform adverse reaction assessment and efficacy evaluation; (10) with contraindications to cisplatin and 5-fluorouracil; (11) with small cell lung cancer, lymphoma, breast cancer while treated for the first time, and ovarian cancer. After ultrasound positioning, one 14 G central venous catheter (Beijing Tiandihexie Tech Co., Ltd., Beijing, China) was placed into the chest using the seldinger technology , and its outer end was fixed on the chest wall with one drainage bag, which was closed with a heparin cap after the surgery. On the first day, the drained effusion was about 800~1000 ml, and on the second day, the drainage within 2 h should be <100 ml after the pleural effusion was intermittently drained or obstruction factors such as catheter blockage were excluded; after confirmed by ultrasound or chest X-ray, each patient was performed catheterization for drug perfusion. Group C was injected with 3 M units of interleukin-2 (1M units/ampule, Shanghai Hua Xin High Biotechnology Co., Ltd., Shanghai, China), fluorouracil (0.25 g/ampule, Tianjin KingYork Group Co., Ltd.), and cisplatin (30 mg/ampule, Jiangsu Hanson Pharma Co., Ltd., Jiangsu, China). If the drainage amount was greater than 200 ml 24 h later, 3 M units of interleukin-2 and fluorouracil were re-injected; group T was injected with 15 mg of verapamil injection (5 mg/ampule, Shanghai Hemu Pharmaceutical Co., Ltd., Shanghai, China), 3 M units of interleukin-2, fluorouracil, and cisplatin, followed by reperfusing 10 mg of verapamil. If the drainage amount was greater than 200 ml 24 h later, verapamil, 3M units of interleukin-2, and 5-fluorouracil were reperfused; each patient was instructed laying in the lateral position (left or right) and coughing or breathing using a little force so as to facilitate the drug to contact with the parietal and visceral pleura. The chemotherapeutic drugs (cisplatin+5-fluorouracil) referred to the diagnostic criteria of malignant tumors issued by the Chinese Society of Clinical Oncology (CSCO) . Methods: 1) Preoperative routine intravenous infusion: 100 ml of 0.9% NS+5 mg of dexamethasone, intravenous infusion 100 ml of 0.9% NS+8~16 mg of ondansetron; 2) the dosages of the chemotherapeutic drugs (cisplatin+5-fluorouracil) were calculated referring to each patient's body weight and body surface area, combining with the general situations of each patient’s heart, liver, and kidney function before the treatment. Medication and sequence of group C: 10 ml of 0.9% NS+3 M units of interleukin-2; 50 ml of 0.9% NS+60~120 mg of cisplatin; 100 ml of 0.9% NS+0.75~1.0 g of 5-fluorouracil; if the drainage amount was greater than 200 ml 24 h later, the patient was injected 10 ml of 0.9% NS+3 M units of interleukin-2; 100 ml of 0.9% NS+0.75-1.0 g of 5-fluorouracil; medication and sequence of group T: 50 ml of 0.9% NS+15 mg of verapamil; 10 ml of 0.9% NS+60-120 mg of cisplatin; 100 ml of 0.9% NS+0.75-1.0 g of 5-fluorouracil; 50 ml of 0.9% NS +10 mg of verapamil; if the drainage amount was greater than 200 ml 24 h later, the patient was injected 50 ml of 0.9% NS +15 mg of verapamil; 10 ml of 0.9% NS+3 M units of interleukin-2; 100 ml of 0.9% NS+10 mg of verapamil. The two groups were performed conventional symptomatic treatment after the treatment. The blood routine, liver and kidney functions, and ECG were examined before and after the treatment. Each patient was performed chest X-ray, ultrasound, and Computed Tomography (CT) to evaluate the clinical efficacy, adverse effects, sign and symptom changes, KPS score, and body weight before the treatment (T0), as well as on the 30th (T1) and 60th d (T2) after the treatment. Each patient’s survival time was also followed up. The patients were evaluated the drug toxicity (grades 0-IV) according to the classification criteria of NCI-CTC 3.0 . Meanwhile, the heart rate and blood pressure changes were monitored before and after the perfusion of verapamil, and the patients’ cardiac functions were monitored periodically. According to the efficacy evaluation criteria of unmeasured lesions issued by World Health Organization (WHO) , Complete Remission (CR): pleural effusion disappeared for at least 4 w; Partial Remission (PR): pleural effusion was decreased by 50% or more, and maintained for at least 4 w; No Response (NR): pleural effusion was decreased or even increased. Progressive (PD): pleural effusion was increased. CR and PR were recorded as valid, and NR and PD were recorded as invalid. Each patient’s clinical benefit was determined according to the conditions of analgesic consumption, KPS, and body weight . 1: The condition with the amount of analgesic consumption reduced by >50% and maintained for 4 w or longer was defined as clinical benefit-positive; the condition with the amount of analgesic consumption increased was defined as clinical benefit-negative; any other outcomes were defined as clinical benefit-stable. 2: The condition with the KPS score increased by >20 points and maintained for 4 w or longer was defined as clinical benefit-positive; the condition with the KPS score decreased was defined as clinical benefitnegative; any other outcomes were defined as clinical benefitstable. 3: The condition with the body weight increased by >7% and maintained for 4 w or longer was defined as clinical benefit-positive; the condition with the body weight decreased was defined as clinical benefit-negative; any other outcomes were defined as clinical benefit-stable. Among these three parameters, the patient with at least one parameter positive while no parameter negative can be defined as clinical benefit. The 79 patients in the two groups were followed up via phone until December 31, 2016. The toxicities were evaluated according to the criteria of anticancer drug toxicities issued by the NCI-CTC (grades 0- IV) . The classification of cardiac function was evaluated according to the criteria of New York Association (NYHA, grades I-IV) . The data were analysed using the graphpad prism 6; the measurement data were compared using the two independentsample t test and expressed as the mean ± standard deviation (͞x ± s); the intergroup comparison used the unpaired t-test, with P<0.05 considered as statistical significance. After the treatment, group C exhibited 2 cases of CR and 17 cases of PR, with the effective rate (CR+PR) as 51.35%; group T exhibited 6 cases of CR and 29 cases of PR, with the effective rate (CR+PR) as 80.95%; the difference between the two groups was significant (P<0.05) (Table 2). The clinical benefit rates of the KPS score, body weight, and analgesic dosage in group C were 27.02% (10/37), 16.21% (6/37), and 37.50% (3/8), respectively, and those in group T were 83.33% (35/42), 52.38% (22/42), and 66.66% (6/9), respectively, showing significant differences than group C after perfused with verapamil combined with chemotherapeutic drugs (P<0.01) (Table 3). The median survival time of group C was four months, and that of group T was 13 months, showing significant difference between the two groups (P<0.01), indicating that verapamil combined with chemotherapeutic drugs significantly prolonged the overall survival time and median survival time of the patients with MPE (Figure 1). 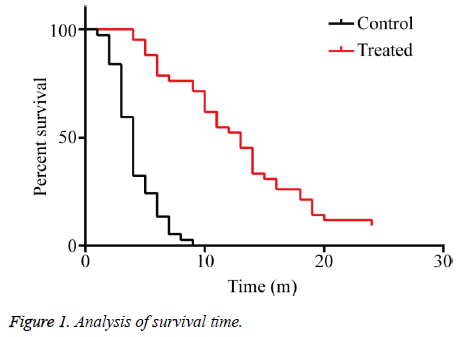 Figure 1: Analysis of survival time. Table 3. Determination of clinical benefits. The patients in group T exhibited grades I and II side effects and were relieved shortly (Table 4), including 17 cases with leukopenia (40.47%), 23 cases with nausea and vomiting (54.76%), 10 cases with diarrhea (23.80%), 6 cases with alopecia (14.28%), 19 cases with fever (45.23%), and 9 cases with liver damage (21.42%), showing no significant difference than group C. No significant change of vital signs (respiration, pulse, or blood pressure) in group T was found before and after the application of verapamil, nor ECG showed any significant difference (Tables 5 and 6). Table 5. Changes of respiration, pulse, and blood pressure in group T (n=42). Table 6. ECG changes in Group T before and after the application of verapamil (n=42). MPE is a common complication in advanced tumors, and can often seriously affect the patients’ respiratory and circulatory functions after multiple standardized anti-tumor drug treatments, thus greatly reducing the patients’ quality of life . The current treatment against MPE mainly uses closed thoracic drainage and injects antitumor drugs or biological agents, but the effects of such treatments are still poor and prone to occurring encapsulated or multilocularpleural effusion [24,25], and the reason may be related to the internal, acquired Multidrug Resistance (MDR) existing inside the tumor cells within pleural effusion and the reduction of anti-tumor drug intake . MDR is one of the main reasons that can limit the clinical effects of chemotherapy against malignant tumors [26,27]. As the main mechanism of MDR, P-glycoprotein (P-gp) can promote the hydrolyzation of ATP, which therefore produces ADP, releases energy, combines with the intracellular chemotherapeutic drugs via the participation of Ca2+, and then “pumps” them out of the cells, thus resulting in the intracellular drug concentrations to be decreased, reducing the toxic effects of the drugs against the tumors, and leading to the MDR [28,29]. Verapamil is an antagonist of Ca2+ channel, and studies have found that it can inhibit the expression of MDR-l gene and the synthesis of P-gp, thereby increasing the chemotherapeutic drug concentrations in tumor cells and overcoming the resistance inside tumor cells . Certain studies have shown that 6~10 μmol/L verapamil can completely inhibit the P-gp activity , thereby reversing the MDR of malignant cells and increasing the sensitivity of tumor cells to chemotherapeutic drugs. However, when the in vivo serum concentration of verapamil reaches 1~2 μmol/L, such side effects as heart rate and blood pressure decreases or atrioventricular block may appear. Some researchers clinically applied verapamil via venous administration while failed to reverse the MDR of tumor cells [32,33], which limited the venous application of verapamil against malignant tumors. We previously perfused verapamil via canine hepatic artery, and the drug concentration in local tissues can reach 50 to 10 times than that in the blood, but no heart rate decrease, blood pressure decrease, or atrioventricular block can be observed . Based on such results, we innovatively applied verapamil combined with chemotherapeutic drugs via trans-peritoneal catheter and achieved good clinical results . In addition, changing the administration ways of verapamil combined with chemotherapeutic drugs in treating liver cancer, colorectal cancer, gastric cancer, lung cancer, or other malignant tumors also have achieved good clinical efficacies, and no related cardiovascular side effect has been observed [12-15]. This clinical study is based on the above studies, and continued the treatment of verapamil combined with chemotherapeutic drugs against MPE via PCC. The 79 MPE patients were randomly divided into the control group (37 patients) and the treatment group (42 patients), while those with small cell lung cancer, lymphoma, breast cancer while treated for the first time, and ovarian cancer were not included into the study. After one-course treatment, group C exhibited 2 cases of CR and 17 cases of PR, with the effective rate (CR+PR) as 51.35%; group T exhibited 6 cases of CR and 29 cases of PR, with the effective rate (CR+PR) as 80.95%; the difference in the treatment efficacy between the two groups was significant (P<0.05). In group C, from the KPS score, weight, analgesic dosage, the rates of clinical benefit were 27.02% (10/37), 16.21% (6/37), 37.50% (3/8); in group T, the patients got more benefit with intrapleural perfusion of chemotherapy and verapamil, from the KPS score, weight, analgesic dosage, the rates of clinical benefit were 83.33% (35/42), 52.38% (22/42), 66.66% (6/9), with significant difference (P<0.01). The median survival time of group C was 4 months, and that of group T was 13 months, and the overall survival time between the two groups showed significant difference (P<0.01). The patients in group T exhibited grades I and II side effects and were relieved shortly (Table 4), including 17 cases with leukopenia (40.47%), 23 cases with nausea and vomiting (54.76%), 10 cases with diarrhea (23.80%), 6 cases with alopecia (14.28%), 19 cases with fever (45.23%), and 9 cases with liver damage (21.42%), showing no significant difference than group C. The changes between groups C and T of respiration, pulse, blood pressure and ECG before and after treatment were not significantly different. The results show that the application of verapamil combined with chemotherapeutic drugs via PCC can improve the efficacy, prolong the median survival time, and improve the prognosis and quality of life in MPE patients, while not increase the side effects. The effects are exact, the method is simple, and the operations are safe and repeatable. We will further expand the sample size and perform further follow-up so as to observe and judge the long-term clinical efficacy of this method. Moreover, we will investigate the metabolic rules of verapamil in MPE based on such clinical studies, thus providing more theoretical basis for the thoracic cavity perfusion therapy of verapamil combined with chemotherapeutic drugs. This study were funded by the National Natural Science Foundation of China (81350005), Anhui Natural Science Foundation (1408085MH211), Clinical Key Specialist Construction Projects in Anhui Province "Twelfth Five-Year" (Department of Oncology, Project Number: 01P34). Yabei Liu, Yingwei Zhu, Gaofei Fan, and Jin Huang contribute the same effects to this study, designed the clinical research, developed and implemented the specific treatment programs, analysed the data, and prepared the manuscript; Chengtao Weng, Qiaohong Duan, Tengyue Zhang, and Lili Tang provided the cases, images, and literature retrieval; Pingsheng Fan proposed the main frame of this study and guided the implementation of the treatment programs. Light RW. Clinical practice. Pleural effusion. N Engl J Med 2002; 346: 1971-1977. Roberts ME, Neville E, Berrisford RG, Antunes G, Ali NJ, BTS Pleural Disease Guideline Group. Management of a malignant pleural effusion: British Thoracic Society Pleural Disease Guideline 2010. Thorax 2010; 65: 32-40. Bradshaw M, Mansfield A, Peikert T. The role of vascular endothelial growth factor in the pathogenesis, diagnosis and treatment of malignant pleural effusion. Curr Oncol Rep 2013; 15: 207-216. Morgensztern D, Waqar S, Subramanian J, Trinkaus K, Govindan R. Prognostic impact of malignant pleural effusion at presentation in patients with metastatic non-small-cell lung cancer. J Thorac Oncol 2012; 7: 1485-1489. Kastelik JA. Management of malignant pleural effusion. Lung 2013; 191: 165-175. Sterman DH, Recio A, Haas AR, Vachani A, Katz SI, Gillespie CT, Cheng G, Sun J, Moon E, Pereira L, Wang X, Heitjan DF, Litzky L, June CH, Vonderheide RH, Carroll RG, Albelda SM. A phase I trial of repeated intrapleural adenoviral-mediated interferon-beta gene transfer for mesothelioma and metastatic pleural effusions. Mol Ther 2010; 18: 852-860. Fysh ET, Waterer GW, Kendall PA, Bremmer PR, Dina S, Geelhoed E, McCarney K, Morey S, Millward M, Musk AW, Lee YC. Indwelling pleural catheters reduce inpatient days over pleurodesis for malignant pleural effusion. Chest 2012; 142: 394-400. Masago K, Fujimoto D, Fujita S, Hata A, Kaji R, Ohtsuka K, Okuda C, Takeshita J, Katakami N. Response to bevacizumab combination chemotherapy of malignant pleural effusions associated with non-squamous non-small-cell lung cancer. Mol Clin Oncol 2015; 3: 415-419. Shuto K, Ohira G, Kono T, Natsume T, Tohma T, Sato A, Ota T, Saito H, Akutsu Y, Uesato M, Matsubara H, Okazumi S, Kaiho T. Regional treatment ofesophagealliver metastasis by intra-arteriallow-dose 5-FU therapy. Gan To Kagaku Ryoho 2010; 37: 2409-2411. Jia W, Zhu Z, Zhang T, Fan G, Fan P, Liu Y, Duan Q. Treatment of malignant ascites with a combination of chemotherapy drugs and intraperitoneal perfusion of verapamil. Cancer Chemother Pharmacol 2013; 71: 1585-1590. Huang J, Duan Q, Fan P, Ji C, Lv Y, Lin X, Qian L, Yu X. Clinical evaluation of targeted arterial infusion of verapamil in the interventional chemotherapy of primary hepatocellular carcinoma. Cell Biochem Biophys 2011; 59: 127-132. Liu Y, Lu Z, Fan P, Duan Q, Li Y, Tong S, Hu B, Lv R, Hu L, Zhuang J. Clinical efficacy of chemotherapy combined with verapamil in metastatic colorectal patients. Cell Biochem Biophys 2011; 61: 393-398. Ning Z, Chen D, Liu A, Fan P, Duan Q, Zhang T, Fan G. Efficacy of chemotherapy combined with targeted arterial infusion of verapamil in patients with advanced gastric cancer. Cell Biochem Biophys 2014; 68: 195-200. Huang J, Zhang T, Ma K, Fan P, Liu Y, Weng C, Fan G, Duan Q, Zhu X. Clinical evaluation of targeted arterial perfusion of verapamil and chemotherapeutic drugs in interventional therapy of advanced lung cancer. Cancer Chemother Pharmacol 2013; 72: 889-896. Porcel JM, Vives M, Esquerda A, Salud A, Perez B, Rodríguez-Panadero F. Use of a panel of tumor markers (carcinoembryonic antigen, cancer antigen 125, carbohydrate antigen 15-3, and cytokeratin 19 fragments) in pleural fluid for the differential diagnosis of benign and malignant effusions. Chest 2004; 126: 1757-1763. Higgs ZC, Macafee DA, Braithwaite BD, Maxwell-Armstrong CA. The Seldinger technique: 50 years on. Lancet 2005; 366: 1407-1409. Li SY, Sun XC, Liu L. Progress of medical and combined treatment for esophageal carcinoma. Ai Zheng 2006; 25: 509-515. Trotti A, Bentzen SM. The need for adverse effects reporting standards in oncology clinical trials. J Clin Oncol 2004; 22: 19-22. Palmer MK. WHO handbook for reporting results of cancer treatment. WHO 1980. Kim JJ, Jung HC, Song IS, Choi KW, Kim CY, Han JK, Choi BI, Park JG, Lee KU, Choe KJ, Kim WH. Preopertive evaluation of the curative respectability of gastric cancer by abdominal computed tomography and ultrasonography: a prospective study. Korean J Int Med 1997; 12: 1-6. The Criteria Committee of the New York Heart Association. Nomenclature and Criteria for Diagnosis of Diseases of the Heart and Great Vessels (9th ed.). Boston, Mass: Little, Brown & Co 1994; 253-256. Walker S, Bibby AC, Maskell NA. Current best practice in the evaluation and management of malignant pleural effusions. Ther Adv Respir Dis 2017; 11: 105-114. Chen CD, Wang CL, Yu CJ, Chien KY, Chen YT, Chen MC, Chang YS, Wu CC, Yu JS. Targeted proteomics pipeline reveals potential biomarkers for the diagnosis of metastatic lung cancer in pleural effusion. J Proteome Res 2014; 13: 2818-2829. Zarogoulidis P, Chatzaki E, Hohenforst-Schmidt W, Goldberg EP, Galaktidou G, Kontakiotis T, Karamanos N, Zarogoulidis K. Management of malignant pleural effusion by suicide gene therapy in advanced stage lung cancer: A case series and literature review. Cancer Gene Ther 2012; 19: 593-600. Liu L, Zuo LF, Guo JW. ABCG2 gene amplification and expression in esophageal cancer cells with acquired adriamycin resistance. Mol Med Rep 2014; 9: 1299-1304. Wang LS, Chow KC, Wu YC, Lin TY, Li WY. Inverse expression of dihydrodiol dehydrogenase and glutathione-S-transferase in patients with esophageal squamous cell carcinoma. Int J Cancer 2004; 111: 246-251. Xiang QF, Zhang DM, Wang JN, Zhang HW, Zheng ZY, Yu DC, Li YJ, Xu J, Chen YJ, Shang CZ. Cabozantinib reverses multidrug resistance of human hepatoma HepG2/adr cells by modulating the function of P-glycoprotein. Liver Int 2015; 35: 1010-1023. Noguchi K, Katayama K, Sugimoto Y. Human ABC transporter ABCG2/BCRP expression in chemoresistance: basic and clinical perspectives for molecular cancer therapeutics. Pharmgenomics Pers Med 2014; 7: 53-64. Rogalska A, Szwed M, Rychlik B. The connection between the toxicity of anthracyclines and their ability to modulate the p-glycoprotein-mediated transport in A549, HepG2, and MCF-7 Cells. Sci World J 2014; 2014: 819548. Qiang F, Guangguo R, Yongtao H, Dandan D, Hong Y. Multidrug resistance in primary tumors and metastases in patients with esophageal squamous cell carcinoma. Pathol Oncol Res 2013; 19: 641-648. Baumert C, Hilgeroth A. Recent advances in the development of P-gp inhibitors. Anticancer Agents Med Chem 2009; 9: 415-436. Donmez Y, Akhmetova L, Iseri OD, Kars MD, Gunduz U. Effect of MDR modulators verapamil and promethazine on gene expression levels of MDR1 and MRP1 in doxorubicin-resistant MCF-7 cells. Cancer Chemother Pharmaco 2010; 67: 823-888. Sun X, Yin Q, Chen D, Dong X, Zhou L, Zhang H, Fan P. Determination of verapamil in dog serum and tissues by reversed-phase high performance liquid chromatography. Se Pu 2004; 22: 255-257.